– It’s an amazing experience that any beauty lover will appreciate. – There are pure works of art to see from some pure talent. – It is *not* a giant beauty bargain market, so don’t go expecting to take home sacks of make-up for 50p. – That being said, there are some bargains and good discounts to be had on brands, including those you can’t always get easily in the UK. – It is busy, if crowds aren’t your thing then neither is IMATS. – There is a cash machine but there are long queues, most vendors took cash but I’d suggest taking cash just in case. – There are lots of rather hot, scantily clad men (see below). I went to the show alone and arrived at around midday. It was crowded but there wasn’t a huge line of people so no waiting outside. Stands were busy and on some it looked as though a fair amount of stock had sold out. I did make the mistake of missing some stands by not looking at the map properly, but for my bank balance this is probably for the best. 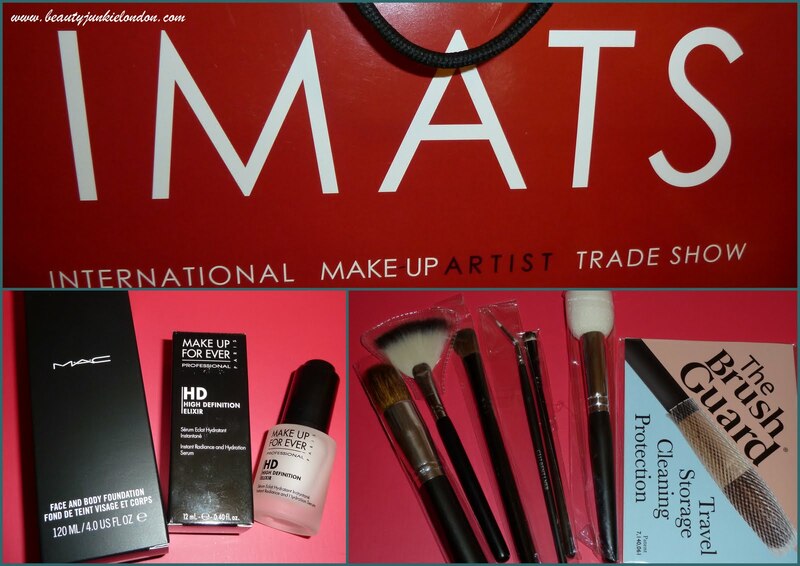 I did pick up a few products, some cheap but decent make-up brushes and a pack of brush guards (very useful) from Crown Brush, a new MAC Face and Body Foundation in a winter skin shade (which was matched amazingly quickly by a very lovely MAC artist – best service I’ve had from a MAC counter, ever!) and an AMAZING ‘HD Elixir’ from Make-Up Forever which deserves it’s own review. All products bought by me. Wow, you were pretty well behaved at IMATS! I swear I’d probably run around trying to buy everything in sight if I ever do go. It is therefore probably for my own good that I stay away. Love the picture of the semi-naked model. It seems that most posts on IMATS that I’ve read all included a photo of some MALE model or other, lol.